Krishna savors diversity from various kinds of pure, transcendental love. As we enjoy a variety of relationships in our families and society, so does Krishna, but all of His relationships are eternal, transcendental, and completely free of material contamination. Each of Krishna’s devotees interacts with Him in one of five primary relationships. In ascending order of intimacy, these five are neutrality, servitude, friendship, parental affection, and conjugal love. Each includes the primary sentiments of the ones before it, and then adds its own flavor. Pure love of God reaches its summit in romantic exchanges with Krishna. Devotees in the mood of neutrality witness and support Krishna’s pastimes by their presence as plants, animals, streams, and so on, as well as normally inanimate objects like houses—all of which are fully conscious in Goloka. Devotees in the service mood run errands for Krishna, pack His lunch, wash His clothes, and perform other demonstrations of love for Him as the moment indicates. Devotees in the fraternal mood serve Krishna by being His friends. They are sometimes boastful, considering themselves equal to Krishna. In His company, they herd cows and enjoy games in the beautiful country setting. 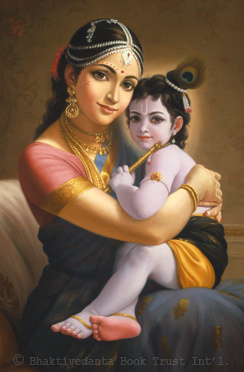 Devotees in the parental mood see themselves as Krishna’s provider and protector. Krishna behaves with them like a dependent child. His mother cuddles Him, carefully prepares His meals, and thinks only of His protection. His father sees that He has all the comforts of a normal home. Devotees in the conjugal, or romantic, mood offer service as Krishna’s girlfriends, relating with Him in the intimacy of lover and beloved.